There’s nothing better than a dramatic before and after reveal. Over the years, we’ve had the pleasure to assist many homeowners with their renovations and take great joy in sharing the transformations here. For us, these before and afters are the fuel that gets our creativity flowing. We hope you enjoy these 5 before and afters and feel inspired to take on some projects in your own home. We worked with Sean & Carrie years ago to transform their home into something that reflects their personalities. They hired Tuck Interiors, which was Punch Inside at the time, and Judith Mackin to come into their home and transform what they referred to as their ‘university style’ to something that better reflects who they are now. You can learn more about this transformation by reading the original before & after post here. Interiors & Styling by Judith Mackin. Furniture & Accents from Tuck. Above: Harry Allen Bank in the Form of a Pig (gold) from Tuck. Custom Fireplace & Hidden TV Built Ins designed by Judith Mackin, built by CM Woodcraft. Photo by Sean McGrath. Another one of our favourite makeovers is the home of Jennifer Shea & David Gamble. 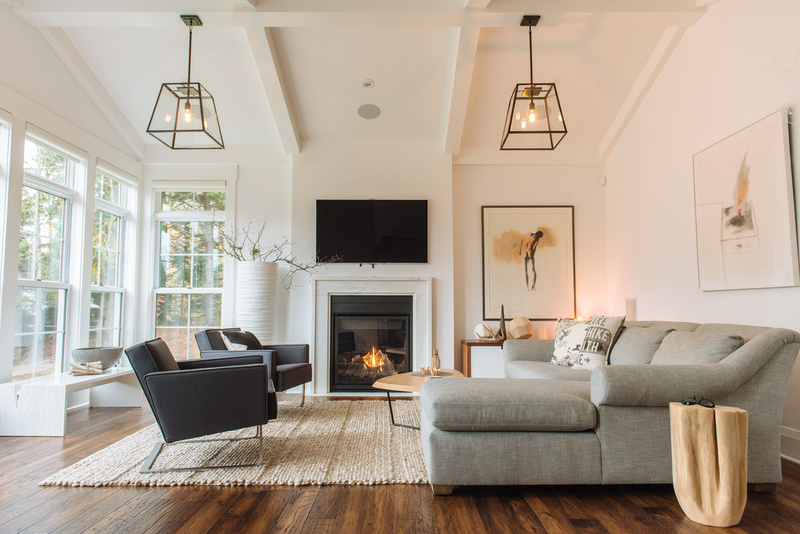 The couple enlisted the services of Tuck Interiors and Judith Mackin to makeover their new home. The goal was to brighten and modernize the home to better reflect Jennifer & David’s personal style. Read the full before & after here. One of the most dramatic changes was painting out the red sunroom and bringing in some fresh and modern furniture and accents from Tuck. Above: Gus* Modern Lodge Chairs in Varsity Charcoal, Jax Rug, Tiffany Side Table, from Tuck. Photo by Kelly Lawson. Jeff Sheppard came to us after completing some renovations in his new home. While the renos turned out beautifully, the home was in need of some decorations and finishing touches. Enter Tuck Interiors & Judith Mackin. We filled the home with new furniture and decor from Tuck. See the full before & after here. Above: Artwork by Suzanne Hill, Dining Table, Chairs are all from Tuck. Photography by Christiana Myers. The Darling Cottage is simply darling! This cottage makeover is among our favourite before and after transformations. One of the most impactful changes was the removal of the living room wall, creating more space for a larger dining table and letting light into the kitchen and side entry. Above: Chairs, ceiling light, and tableware from Tuck. Photo by Kelly Lawson. We worked with Jennifer & Jordan Kavanaugh years ago to makeover their new home. The renovations included a new kitchen, painting throughout the home, refacing the living room fireplace, and replacing the tiles in the front entrance. Not shown in the photo below is the amazing view from the living room. By painting the walls out white, the room not only feels brighter, but it allows the eye to focus on what’s really important, their spectacular view. Read the full before and after for photos. Above: Lucca Area Carpet in Rust/ Ivory, Table Lamps, and Ottoman all from Tuck. Photo by Kelly Lawson. Thanks for reading! See all our before & after reveals here. Thinking of taking on a project in your own home? Book a home consultation. We’ll visit your home (or business) and give expert advice on room layout, furnishings, lighting, art, flooring and paint choices. We’ll help you reimagine everything from a one-room makeover to a complete renovation. Good Design begins with a plan. And that plan will save you money. Consults are $160 / hour. Email [email protected] to find out more and to schedule a consult.